Tired of bandits chasing after deer instead of fighting you? Me too! Unofficial Skyrim Special Edition Patch Makes several edits to generic NPCs which this mod forwards. Picture it: you're coming up to a bandit fort with your weapon drawn, the bandits stream out, you close for the fight... and suddenly the lead bandit decides that deer on a faraway hill must die. Right now. Off he runs, yelling threats at a deer. Sometimes the rest of the bandits join in and we form a merry Benny Hill conga line on the tundra. It's funny/annoying and I got tired of it. It takes an epic moment and turns it into a farce. These things happen because Bethesda set the aggro slider to "very aggressive" on generic bandits and other enemies instead of bothering with the faction system the game has. This makes a NPC want to murder anything not directly allied to its faction, and from there it's a crapshoot as to what the AI actually decides to target. That's my theory anyway. Now if you set the aggro slider to something less murderous, the result will be that the enemy NPCs just stand around, since their AI has no idea who their enemies are. They need factions for that. This mod fixes both issues. 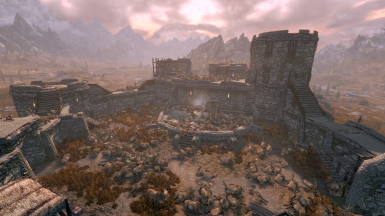 The different factions in Skyrim fight each other in much the same way as they do in Vanilla (minimal change), minus a lot of random animal slaughter. ﻿Bandits: hate all other major factions, and are hated by all. ﻿Vampires: hate all other major factions, and are hated by all, except some animals. ﻿Warlocks + Necromancers: allied to each other, and to not much else. ﻿Forsworn + Hagraven: allied to each other, and to not much else. 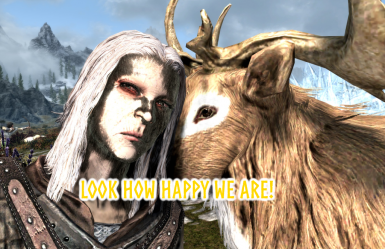 Hate spriggans, love goats. ﻿﻿Guard faction: a bit more expressly aggressive versus monsters and predators while defending the civilians. ﻿Dawnguard: mainly busy fighting vampires but not above a little monster hunt. ﻿Cultists: nearly unchanged from vanilla, hate you and any guard faction member. ﻿Civil War (Sons + Empire): will kill bad guys but generally really busy with that war thing. ﻿Companions: will take on any monster and defend the citizens. ﻿Vigilants: mainly interested in snuffing out Daedra and Dremora but will stamp out evil wherever. ﻿Thalmor: hate the bandits etc, are friends with the empire. resets the baseline for aggro on NPC records for all generic vanilla bandit, vampire, warlocks, necromancers, forsworn, hagraven and cultist encounter NPCs to "aggressive". This will cause those factions to attack enemy factions and ignore neutral factions (which is the default faction-faction state). since the NPCs are no longer blinded by homicidal rage their "confidence" setting comes into play (think of it as "courage"). The majority of bad guys in the above factions are still the "fight to the death" maniacs you know and love to kill. But some will recognise a stronger opponent and try to evade combat, and some will flee when the tide turns against them. Bandits can be cowards, and a sprinkling of different confidence settings was applied to reflect that ingame. ﻿1. Some bad guys have an 'aggro radius', meaning they will threaten first and only fight if you get too close. If some hapless animal breaks that radius, it's going to die, and because bandits are all buddies, the rest of the bandits will engage too. This is normal. BUT since the deer is a neutral faction and you, the player, are hated, if you engage they will switch targets much quicker and generally be better at keeping focus in a fight. Not perfect. Better. Fun! ﻿2. There is some (intentional) faction asymmetry - imagine faction A is allied with faction B but hates faction C. Faction B loves faction C. What will happen when they all meet? Fun! ﻿- undead/dragonpriests/skeleton etc factions who hate all life and don't have the same thought processes and goals as living mortals. ﻿- dragons, there are other mods which do a great job of altering dragons already. ﻿- the falmer who hate all surface life and are generally murderous. ﻿- any animal faction as there are plenty of wildlife mods out there already doing a much better job with them than I ever could. I did not change any other settings outside of the scope of this mod as outlined on this page. OTHER MODS: This mod will not change any enemies added by other mods and both will revert any NPC changes to the generic bad guys in case of overlap (who wins depends on load order), separate NPC patches will have to be made (although the faction changes will still take effect). I'm working on a SIC + OBIS patch, since I play with both mods installed, but any patches beyond that will have to be made by the community. I'm happy to host them on this page, ping me if you have one ready. I have no idea. There are thousands and thousands mods on the nexus, countless vanilla questlines and locations, so I'm sure something somewhere will break. I don't know why Bethesda decided to just make every enemy mega-aggressive and not use factions, but I assume they had a reason. Seems to work okay though. Make a save before you install this mod. I've been playing and testing and generally things seem to work well, I haven't seen any npc behavior that's grossly out of line with expectations. Overall, any breakage should be easy to roll back. If you're going to report an issue, please avoid "it does not work" or other useless comments. Be specific and descriptive. Which NPC(s) did not work as expected? Where did it happen? On a quest, and which one? Where is the mod in your load order? Drop the mod in your data folder or install with your mod manager of choice. Suggested load order is somewhere near the end, before any bashed patch/ASIS/other fancy custom patch stuff. Make sure the faction/NPC changes get forwarded in your patches! Optionally install one or more of the community-provided patches for several other popular mods on the Nexus. ON AN EXISTING SAVE/GAME IN PROGRESS it may be necessary to wait for all the cells ingame to reset (31 days) before all the faction changes get applied. Go to an inside cell with no other NPCs. Save your game. Exit the game. Remove the mod. Start the game. Load your savegame. Carry on. This mod has no scripts or other complex stuff, and only overwrites some simple records. This mod changes 14 vanilla factions, many of which are not generally used by other mods (or by Bethesda ha ha). Changes a bunch of generic/unnamed bad guys NPCs. If there are incompatibilities it will mostly show in vanilla generic bad guy NPCs still murdering wildlife with abandon or just standing around not fighting. This mod requires USSEP as master and forwards the (minor) changes it makes to several of the NPC records involved. Other mods which add more enemies will need to be patched if you want the same behavior from those NPCs as most go with the "very aggressive" setting. A patch for SIC + OBIS is in the works and should be up somewhere this week. Other patches will need to be written by you, the community.